The Academic Staff Union of Polytechnics (ASUP), Federal Polytechnic, Ukana brach in Essien Udim Local Government Area of Akwa Ibom State has called on the Governing Council of the school to suspend the institution’s rector, Prof. Balama Obomanu, and bursar, Mr. Sunday Okpo, over alleged corruption. The union made the call in a petition signed by the Protem Chairman Inyangetoh Jude, Protem Secretary Ariye Anthony, and made available to newsmen in Uyo Tuesday. The union particularly accused the two officers of the school of making illegal deductions from staff salaries and refusal to pay full salary for more than two years. Speaking on the issue, the union’s chairman accused the rector of refusing to pay the yearly step increment in salary for more than two years; deliberate refusal to release monthly pay slips to workers for more than two years; abuse of procurement processes in executing capital projects; failure to provide electricity on campus daily, as well as embezzlement of internally generated revenue and overhead releases. 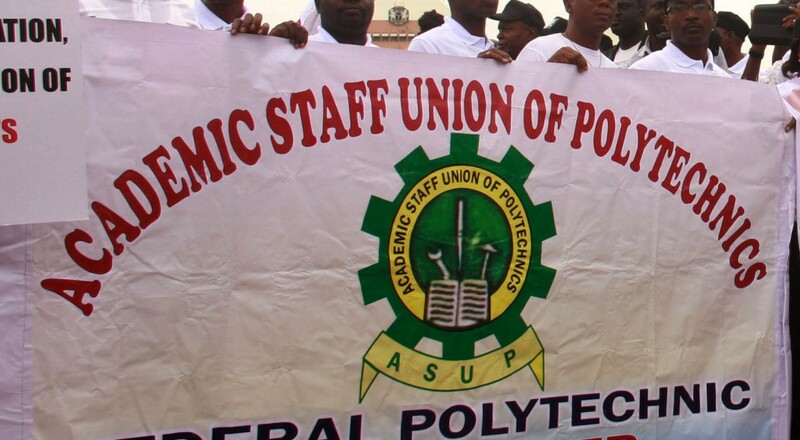 In the petition, the union also alleged that the rector appointed an unqualified person as director of works/physical planning; introduced ghost workers in the nominal roll of the polytechnic contract staff; inability to secure a single course accreditation after three years of running the polytechnic, and non-payment of 28 days allowance benefit to workers recruited in July 2015. “Award of TETFUND projects to cronies without due process; deliberate attempt to stop the formation and existence of ASUP in the polytechnic; deliberate attempt to browbeat and victimise leaders and members of ASUP in the polytechnic and undermine the process of free elections in ASUP. “Fraudulent parade of the different sets of nominal rolls, one that meets the expectations of government and NBTE and the other for defrauding members of staff; whereas available record shows that the polytechnic receives more than N2m as monthly overhead cost, the rector and the bursar claim they are only given a paltry N600,000 per month,” the petition read. In a similar vein, youths from Ukana Ikot Ntuen, host community to the polytechnic, have protested the continued stay of the rector in the institution, noting that the continuous stay of the rector in the institution is calamitous. The rector, while reacting to the allegations, said as a rector of the institution he does not have power to do things on his own without approval from different stakeholders of the polytechnic. He said: “All those things are not true; the school cannot be run like a private property, because I do not initiate or finalise things. “There are processes that are involved that had been established by the federal government on how schools are run. We have management; we hold management meetings; we have academic board; we have council and hold council meetings. “As I speak with you now, we are holding the sixth council meeting. So, there is no way I would have sat and take decisions on my own; I am not above the council to take decisions alone. Decisions are conveyed to council for ratification. “When they say we do not have a single accreditation, it is wrong. We have two programmes running and they are due for full accreditation this year.